On 4 March 2015, the Presidency of the Council of the European Union received the mandate from the Member States to start negotiations with the EU Parliament and the Commission on the “Telecommunications Single Market Regulation”, which includes provisions on net neutrality. => Read EDRi’s position (here) and proposals for amendments (here). 4 March 2015: Council’s mandate to start trialogue negotiations. 5 March 2015: Commissioner Oettinger considered net neutrality as a “taliban-like issue”. 19 March 2015: MEP Julia Reda asked a parliamentary question to Oettinger what telemedicine and transport services would be (tali)banned by net neutrality. In his response, Oettinger confirmed he cannot name one e-health/transport service that would be damaged by net neutrality. 15 April 2015: New Council text, leaked by Statewatch. 17 April 2015: The Committee of Permanent Representatives in the Council (COREPER) approved the Council text of 15 April (no changes). 21 April 2015: European Commission’s (pseudo) compromise text proposal, leaked by Politico. 27 April 2015: New Council text, leaked by Statewatch (only changes on roaming). 8 May 2015: European Parliament’s first compromise text, leaked by Politico. 17 May 2015: Council’s new “compromise text” on net neutrality (internal document), leaked by La Quadrature du Net. 22 May 2015: reviewed version of the Council’ Presidency “compromise” text. => Read EDRi’s reaction: is the European Parliament ready to accept complete failure? 24 May 2015: The Latvian Council Presidency drafts a new “compromise”. 26 May 2015: The 24 May Council text version is sent to Member States delegations, text published by the Council. 27 May 2015: The Latvian Presidency sends a new version of the Council text to the European Parliament with some changes as compared to the 26 May version. 29 May 2015: The Council produces a new mandate slightly changing the Latvian Presidency text of 27 May 2015. 4 June 2015: The European Commission writes a “non-paper”, leaked by La Quadrature du Net. => Read EDRi-Access’ joint reaction: “Net Neutrality – Building on success” and EDRi’s “subsequent comment“: European Parliament considering yet another compromise on net neutrality. 12 June 2015: Council confirms it wants to trade net neutrality for the end of roaming charges and Commissioner Oettinger seemed to agree. 18 June 2015: European Parliament’s second compromise text, leaked by Contexte. => Read our reaction and the Father of Net Neutrality’s. 24 June 2015: New Council text, adopted by COREPER. 29 June 2015: draft texts circulate around in the 4th trialogue to try to reach an agreement. 30 June 2015: Between 2 and 3am, the three institutions reach a provisional agreement regarding the articles, leaked by La Quadrature du Net. => Read EDRi’s press release: “Blurry, ambiguous “net neutrality” deal is an abdication of responsibility”. 2 July 2015: The European Commission proposes technical drafting suggestions for the recitals (i.e. explanatory notes to the articles). 3 July 2015: The three institutions reach a provisional agreement regarding the recitals. 8 July 2015: COREPER approves the political agreement of the three institutions, published by the Council. 15 July 2015: The Committee on Industry, Research and Energy of the European Parliament (ITRE) formally adopted the text of the informal trialogues. 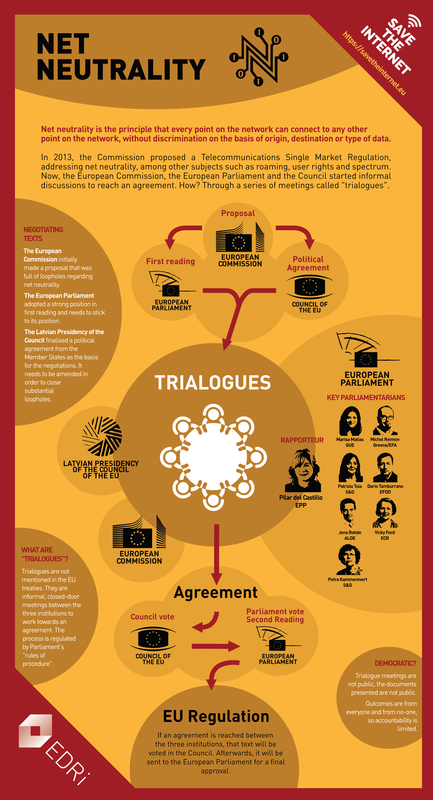 1 October 2015: The Council of the European Union adopted the trialogue agreement as its first reading position, published by the Council. => Read the Save The Internet‘s coalition reaction. 13 October 2015: The Industry committee (ITRE) recommended the Parliament to adopt Council’s first reading text. 14 October 2015: EDRi and its Save The Internet partners proposed amendments to improve four unclear points. All of our amendments were tabled. 27 October 2015: The European Parliament adopted the Regulation without amendments, i.e. the Parliament decided not to decide. 25 November 2015: The Regulation on open internet access and roaming was formally adopted. 26 November 2015: The Regulation was officially published. 30 November 2015: Entry into force of the Regulation. 15 December 2015: EDRi provided a written response to BEREC’s stakeholder dialogue with representatives of end-users/consumers and civil society. 30 April 2016: the entire Regulation is applicable except for certain provisions (mainly on roaming). 1 June 2016: Contexte leaked the draft BEREC’s guidelines on net neutrality. 6 June 2016: Start of the public consultation on the implementation of the Net neutrality Regulation – based on the draft guidelines of the BEREC. 7 July 2016: the European Commission and big operators and vendors attack net neutrality and BEREC’s independence. 18 July 2016: BEREC’s consultation ends. => Read EDRi’s policy analysis of the draft BEREC guidelines and our response to the public consultation, which recommends specific amendments. 2-3 August 2016:EU Telecom Regulators meet to analyse over 500 000 consultation responses. 8 August 2016: EDRi and more than 30 NGOs sent an open letter to lawmakers in charge of EU telecoms regulation and global ICT ministers to ensure high quality connectivity and net neutrality go hand in hand. 25 August 2016: BEREC holds an extraordinary meeting to inter alia adopt the final net neutrality guidelines. 26 August 2016: New version of BEREC’s guidelines, leaked by Politico. 30 August 2016: BEREC publishes the final net neutrality guidelines. VICTORY: Net neutrality wins in Europe! 31 December 2016: Deadline for Member States to repeal national measures (including self-regulatory measures) which go against Article 3(2) or 3(3). Those measures must be notified to the Commission by 30 April 2016. 30 June 2017: Telecom regulators will provide BEREC and the European Commission with an annual report of implementation. 30 April 2019: European Commission’s report to the European Parliament and the Council reviewing Article 3 (safeguarding of open internet access), Article 4 (transparency measures for ensuring open internet access), Article 5 (supervision and enforcement) and Article 6 (penalties), including proposals for amendments, if necessary. The Commission will have to issue a report every 4 years as of 30 April 2019. Click here to download the infographics (PDF). We save(d) the internet through collective effort via http://savetheinternet.eu and years of work! For more information on how the EU works, read our Activist guide to the Brussels Maze.